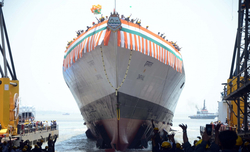 Mumbai: INS Khanderi, the second of the indigenously-built Kalvari Class submarines, was launched at the Mazagaon Docks Shipbuilders Ltd (MDL) here on Thursday morning. 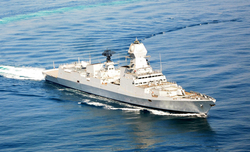 Minister of State for Defence Subhash Bhamre, Chief of Naval Staff Admiral Sunil Lanba, top defence and navy officials were present to witness the momentous development as the country entered the golden jubilee year of the navy's submarine arm in 2017. 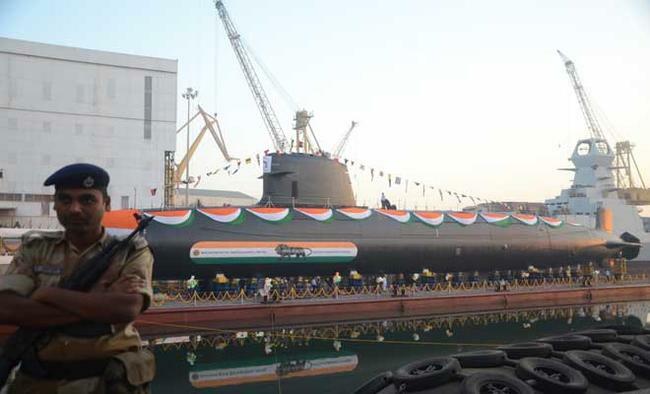 "The day is not far off when India will build submarines for other nations," Bhamre said on the occasion as the vessel was separated from the pontoon where it was being assembled to setting it afloat.Bhamre added that Project 75 is "a milestone in self-reliance and indigenisation for the country". 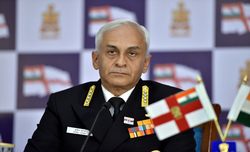 Comparing INS Khanderi with the best submarines in the world, Admiral Lanba said it speaks highly of the experience and expertise our shipbuilders have gained over the years and marks the beginning of a new chapter in India's submarine capabilities. The new submarine would, till December, undergo rigorous tests and trials in the harbour and at sea, on surface and underwater, testing each system to its fullest capacity, before she would be commissioned into the Indian Navy. The construction of six Scorpenes was currently underway at the MDL under Project 75 with transfer of technology from the collaborator, Messrs DCNS, France. While the first Scorpene, INS Kalvari is undergoing sea trials and expected to be commissioned middle of 2017, these submarines would form the core of Indian Navy's conventional Submarine Arm. 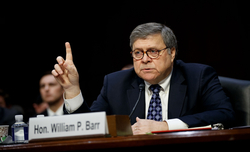 It can undertake multifarious missions like anti-surface and anti-submarine warfares, intelligence gathering, mine-laying, area surveillance, etc, that are typically undertaken by any modern submarine. The Khanderi has been built on 'Modular Construction', which divided it into several sections and outfitting them concurrently, a complex task involving laying kms of cabling and piping in extremely congested compartments. All the equipments have been installed in the submarine with 95 per cent cabling and piping completed while processes like pressure testing, setting-to-work and commissioner of various systems are currently underway and continue after it is launched. The most important safety milestone of 'vacuum testing' was completed in the very first attempt on a single day, January 5, matching the record of Kalvari which also completed it in one shot - a feat unmatched in submarine construction history. As per Indian Navy traditions, Khanderi has been christened after her illustrious predecessor, an erstwhile 'Foxtrot' Class submarine which was decommissioned in 1989, after two decades of service to the country. Khanderi's launch signals a critical milstone for MDL which has earlier delivered two Shishumar Class submarines in the 1990s, strengthening its position as a submarine building yard. Having humble beginnings as a small dry dock facility for the East India Company, in the 18th century, after over two centuries, MDL has established itself as a forefront Defence Public Sector Undertaking, taking up constructions of ships, warships, stealth frigates and submarines.